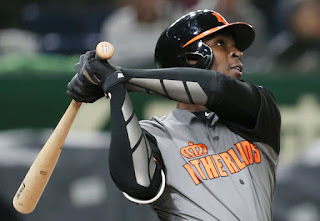 The second round of the World Baseball Classic got underway this past weekend with teams from the Netherlands and Japan already securing spots in the championship round. The other two remaining spots will be decided by the end of this week, with teams from the United States, the Dominican Republic, Venezuela, and Puerto Rico vying for those two spots. The Yankees have been well represented in this tournament, with six players and two coaches representing their respective countries. With this edition of the WBC just over half over, I’m here with an update on how the Yankees throughout the tournament are doing. Pena has been tapped with a prominent role in this tournament, taking on the role of manager for the team from the Dominican Republic and managing the reigning champions to a 4-1 record so far. Even though his team lost their first game of the second round, they should still be considered a favorite to secure a spot in the final round. He was ejected from their loss again Puerto Rico, but the DR responded with a win over Venezuela last night. The Yankees third base coach is a member of the staff of a Puerto Rican team that ended an 11 game win streak in WBC play by the Domincan Republic. With a win over the reigning champs in hand, Espada and the Puerto Ricans have made their road to the finals a little easier. To this point, Gregorius has been a key contributor for a very talented Netherlands team. He has played shortstop and designated hitter so far in the tournament and posted impressive numbers, batting .348 in 23 at bats including four doubles, one home run and eight RBIs. With the Netherlands already moving on to the final round, we will be seeing more of Didi in the coming days. Betances has been in the news quite a bit this offseason mostly for stuff happening off the field, but he is back on the field with the Dominican Republic team and seems to be in midseason form. So far he has a zero ERA in two innings pitched over three appearances while striking out two and walking three. With the Dominican team contending for a spot in the final round, you will likely see more of Betances before this is all over. Layne pitched for the Italian team that did not advance past the first round. Despite Italy’s early exit, the Yankees were surely paying attention to Layne’s appearances. Layne is one of several pitchers vying for the last spots in the Yankee bullpen and he may have helped his case with his WBC performance. In 3.1 innings pitched over three games, Layne had a zero ERA, four strikeouts and three walks. Yet another prominent member of the Yankees’ bullpen is representing their country, with Clippard pitching for the USA team. So far, Clippard has 1-0 record with a zero ERA in three innings pitched over two games with five strikeouts and one walk. 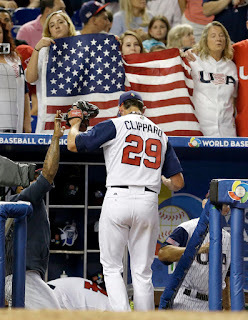 Team USA takes on Venezuela in their first game of the second round Wednesday night and with a spot in the final round up for grabs, continued dominance from Clippard would be a big boost to the USA Squad. A right handed pitcher representing Mexico, Gallegos made one appearance, pitched two innings and allowed one run on four hits with one strikeout and no walks. Mexico was eliminated in the first round so we will not be seeing anymore of Gallegos. Although he performed well in Triple A last season, Gallegos will likely be crowded out of a bullpen spot on the major league roster. Solano is entering his second season with the Yankees. He appeared with the Columbian team that was eliminated in the first round and posted a .267 batting average in 14 at bats, with three hits, two RBI and four strikeouts. Solano is unlikely to be anything more than major league depth in Triple A for the team this year.